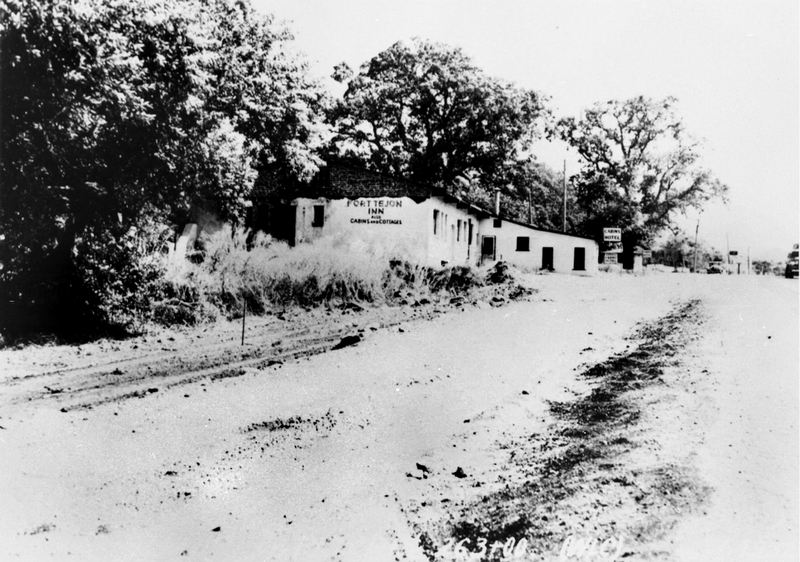 Fort Tejon Inn, ~1940, looking south. 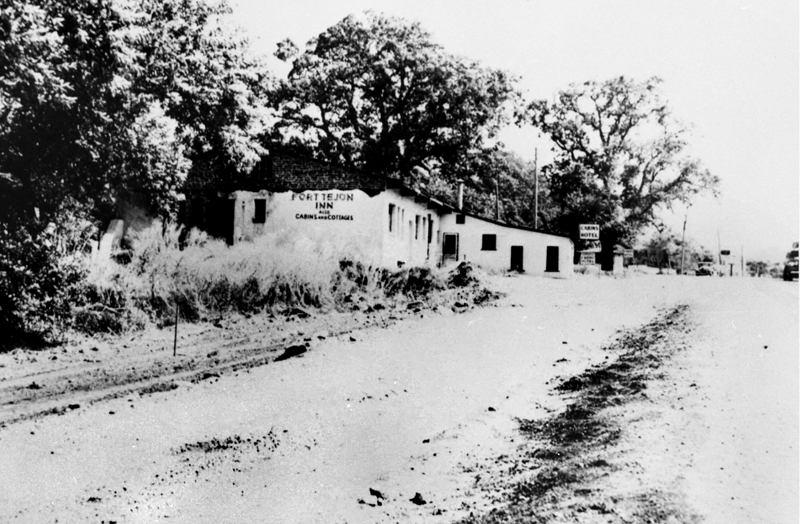 The Fort Tejon Inn opened about 1939-1940 on the east side of the Ridge Route/Highway 99, immediately opposite today's southbound Interstate 5 on-ramp at Fort Tejon. According to Harrison Scott (2002:205-209), the venture started about 1926 when Charlie Yates, personal chauffeur to Los Angeles Times Publisher Harry Chandler, built a gas station on the west side of the highway, just south of the onetime Army fort, on property given to him for that purpose. In 1936, Chandler and Sherman's syndicate took the Tejon Ranch public but retained a controlling interest. By that time, with the construction of the 1933 Ridge Alternate, the highway at Fort Tejon had been expanded from three (total) lanes into a 4-lane divided expressway. The widening compelled Yates to move his service station across the highway to the east side (in the location indicated), and he erected a number of small cabins behind it. In 1934 or 1935 he added a Spanish adobe-style restaurant that served chicken dinners. Apparently the restaurant didn't attract enough of the traveling public (ibid:207), because Yates shut it down within five years and converted it into a hotel that he called the Fort Tejon Inn. Yates partitioned the former dining room into eight guest rooms, each with a bath. The lobby sported a swimming pool and fireplace. "The interior was quite beautiful and had an open-beam ceiling," Scott writes (2002:207). Scott doesn't tell us when it closed, but eventually Yates "closed his gas station and moved to Lebec where he built a motel at the north end of the old gas company property on Lebec Road. The complex had a swimming pool and 10 or 12 cabins, some of which he had moved" from their previous location next to the Fort Tejon Inn (ibid:209). Yates' gas station attendant at Tejon had been Martin Yaeck, whose wife, Elizabeth Yaeck, had been the restaurant's cook. When the Fort Tejon Inn closed, "Martin and Elizabeth Yaeck made it their home. The 40-by-60-foot lobby became their living room. Mr. Yaeck filled the indoor swimming pool with dirt, turning it into a large planter so it would not be a hazard to his children" (ibid:207). LW2527: 19200 dpi jpeg from low-quality jpeg | Online image only.